Celebrate all the beloved moments, visual mastery, moving performances and captivating storytelling of Forrest Gump for its 25th Anniversary. Winner of six Academy Awards®* including Best Picture, Actor (Tom Hanks) and Director (Robert Zemeckis), the generation-defining film is a stunning journey through some of the most memorable events and cultural touchstones of the later 20th century, courtesy of Forrest and the powerful cast of characters. Hanks, Sally Field, Robin Wright, Mykelti Williamson and Gary Sinise all shine their brightest. 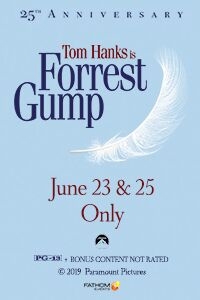 Then, now, always - the world is simply never the same once you've seen it through the eyes of Forrest Gump.